Moringa is a tropical flowering plant with many different species ranging from small shrubs to massive trees. Native to India, the Moringa oleifera is the most widely consumed of the 13 species, noted for its numerous nutritional benefits. Affectionately referred to as the “Miracle Tree,” Moringa has been a revered botanical in both traditional Ayurvedic and Siddha Medicine for centuries. All parts of the tree have been traditionally used such as the roots, leaves, flowers, seeds and pods. Humanitarian organizations have recognized Moringa’s unique nutritional profile and are using Moringa leaves to provide nourishment for underprivileged peoples around the world. The leaves contain an impressive array of nutrients ranging from Vitamins A, C and E to Calcium, Fiber, Selenium, Iron and a host of antioxidants. 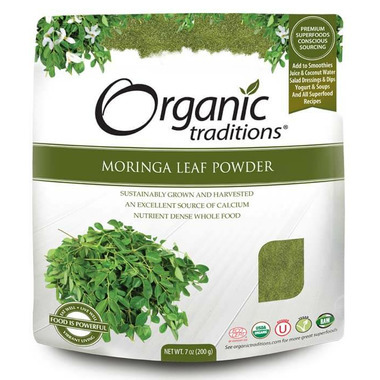 Organic Traditions Moringa leaf powder offers the most nutritious part of the Moringa plant. Fresh moringa leaves are sun dried and ground into a fine powder with no fillers flavors, sweeteners or excipients added. It has a pleasant, subtle green taste that is much milder than wheat grass. It is considered a wonderful daily herb to support general well-being, vitality and health. I love this product! It goes well with yogurt and when mixed with hot tea. Itâ€™s helped with my digestive issues too.